An interview in February with executives at Glaro Incorporated reveals why wet umbrella bag stands have become the single most effective way to keep floors dry and prevent slip and fall injuries in building lobbies and entrances across the USA and internationally. Wet floors are slippery and may result in “slip and fall” injuries. Help keep floors clean, dry, and safe by using wet umbrella bag holders at every entrance. According to executives at Glaro Inc., the Country’s leading manufacturer of indoor umbrella holders and wet umbrella bag stands, providing wet umbrella bags to building visitors is the single most important way to prevent slippery floors and unnecessary injuries during inclement weather. In an interview this month, the company explained how the products have become synonymous with “building safety” and how Glaro’s detection of deficiencies in products from other manufacturers led to their own successful designs and product launch. Glaro Inc. decided to manufacture floor standing wet umbrella bag holders out of solid aluminum that would not rust. They added weighted bases to significantly improve stability. A selection of attractive finish options were created to make the product line aesthetically pleasing. Signage options that encourage use of the wet umbrella bags were also added. In addition, Glaro Inc. developed a product that can be easily mounted to the wall in building vestibules and a bag holder with an adaptor bracket. This unit attaches to existing crowd control stanchions commonly found at check in points and next in line queuing systems. All umbrella equipment lines ship quickly in one to three days. When umbrellas are placed into bags, floors are kept dry, preventing unnecessary slip and fall accidents and costly personal injury lawsuits. “Insurance companies favor the use of products like these because of their effectiveness,” says Robert Glass, Plant Manager. Long lasting eye-catching finishes are available and can be coordinated with other building furnishings. Glaro Inc. uses a rust-proof, tarnish-proof, all-aluminum construction as well as weighted, round bases to keep products looking attractive for years. These design options are superior to cross-base designs, thin bases, and wire formed construction. 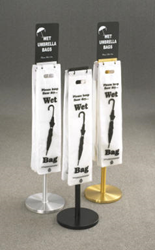 Wet umbrella bag stands prevent the need to have a janitorial staff constantly mopping up and drying floors, which can be disruptive to visitors as well as difficult to execute in busy, high traffic areas. Additionally, the need for expensive, noisy, and unsightly high velocity floor drying fans is substantially reduced. Less maintenance translates to lower maintenance costs for building owners. For more information on the benefits of wet umbrella bag holders and how they can be used in lobbies, entrances, parking garages, coat check areas, elevators, and escalators, contact Glaro Inc. at (888) 234-1050 or visit the company’s website at glaro.com. Glaro Inc. (glaro.com) is a leading USA manufacturer of commercial and consumer aluminum and steel products sold directly to distributors/dealers for almost 70 years. All products ship in 1 to 3 days. Product lines include bellman and luggage carts, platform trucks, metal trash receptacles, recycling receptacles, smokers’ posts and receptacles, crowd control posts and systems, safety barriers, signs, sign frames, directories, menu display stands, coat hanging equipment, coat trees, indoor umbrella holders, wet umbrella bag stands, metal planters, and key drop boxes.